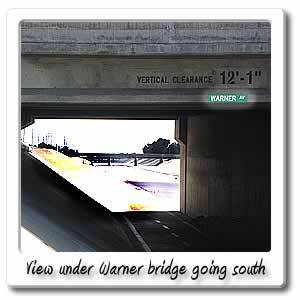 Welcome to Warner Avenue on the Santa Ana River bicycle trail. Just after the 6 mile marker will take you to Warner exit, by going west you will be going into Fountain Valley, 3/4 mile at Euclid you will find an El Pollo Loco, Round Table Pizza, Stater Bros. Across the street from that you will find a Walgreens and 7-11. At the next corner is Mile Square Park. On the other corner is Coastline Community College, Fountain Valley Regional Hospital, and a library. On the other corner you'll find 640 acre Mile Square Regional Park, which is squared off a mile in each direction and includes a Golf Course, playground, several ponds and lake, trails, and 10 baseball fields. 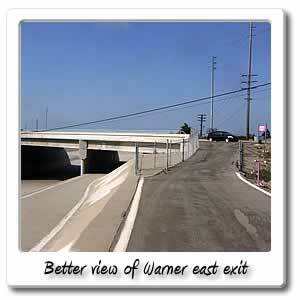 Going east from the bridge will take you around the corner at Harbor Blvd. there you will find a Jack in the Box and Donut Star.